Sogyal Rinpoche's acclaimed spiritual classic is widely regarded as one of the most complete and authoritative presentations of the Tibetan Buddhist teachings ever written. More than 3 million copies have been printed in 34 languages and 80 countries. It has been adopted by colleges, groups and institutions, both medical and religious, and is used extensively by nurses, doctors and healthcare professionals. HarperSanFrancisco, Revised and Updated, 2002. Rider, Revised and Updated, 2002. French: Le Livre Tibétain de la Vie et de la Mort, Nouvelle édition augmentée, La Table Ronde, 2003 (LGF poche, 2005). German: Das tibetische Buch vom Leben und vom Sterben, Fischer Taschenbuch Vlg., 2004. 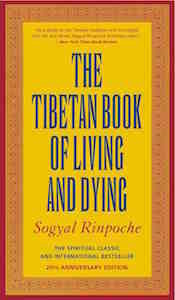 Spanish: El Libro Tibetano De La Vida Y La Muerte, Edición revisada y actualizada, Ediciones Urano, 2006. Chinese (Mainland China and Taiwan), Dutch, Italian, Portuguese and Brazilian Portuguese, Japanese, Korean, Hebrew, Finnish, Turkish, Greek, Thai, Norwegian, Swedish, Danish, Croatian, Slovenian, Serbian, Hungarian, Estonian, Russian, Lithuanian, Latvian, Czech, Bulgarian, Polish, Romanian, Catalan, Hindi, Indonesian (Bahasa) and Vietnamese. This page was last edited on 10 February 2017, at 15:16.